Although implant dentistry has been available and utilized since the 1970’s, there have been many advances in implant dentistry including the All-On-Four concept, or implants in a day. 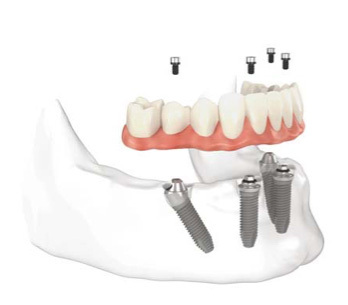 The Las Vegas All on 4 treatment concept provides edentulous (toothless) and soon-to-be edentulous patients with a full arch denture fixed to four implants on the same day as surgery. Not only does the All-On-Four method lead to a rapid improvement in the quality of the patient’s life, but it also provides shorter treatment times and stability even in minimum bone volume. Dr. Spelman carefully coordinates and plans your treatment alongside the best oral surgeons in the Las Vegas valley to offer both immediate and long-lasting benefits. 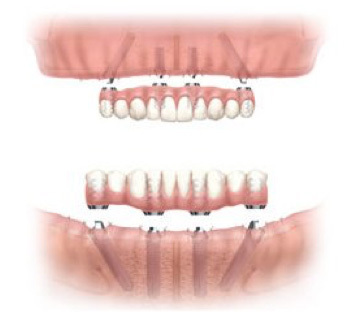 If you already have dentures or have multiple missing or failing teeth the All-On-Four procedure could be the optimal solution for you!